Name Class Date. Materials Part 1. Part 1: Microscopic Structure of Muscle. Part 1: Microscopic Structure of Muscle Diagrams. Download "Name Class Date. Materials Part 1. Part 1: Microscopic Structure of Muscle. Part 1: Microscopic Structure of Muscle Diagrams." 1 Name Class Date Station # Laboratory Investigation 12 Chapter 24C: The Muscular System Human Anatomy & Physiology: Muscular System You may refer to pages in your textbook for a general discussion of the muscular system. Time required: 120 minutes Background Material When a person wants to show the size of his muscles, we say that he is flexing his muscles. When we study anatomy, we discover that the action of flexing a muscle will always cause a joint to bend. For example, when you flex the biceps muscle in your upper arm, your arm will bend at the elbow. To extend your arm (straighten it at the elbow joint), your triceps muscle must contract. The biceps and triceps work together as a pair to allow you to bend and straighten your arm. Two other groups of muscle pairs include the deltoid and the pectoralis major, which are also involved with moving the arm, and the hamstrings and quadriceps femoris groups that move the leg. Materials Part 1 microscope; microscope slides of muscle tissue; colored pencils Part 1: Microscopic Structure of Muscle The muscles mentioned above are all skeletal muscles that function to move the bones. Visceral muscle and cardiac muscle differ from skeletal muscle in both structure and function. The differences in structure can be observed with the microscope. Examine a permanent slide of skeletal, cardiac, and visceral muscle. Refer to the photographs on page 399 of your textbook as you examine the slide. Begin your observation with the skeletal muscle. Since all three muscle samples are on the same slide, refer to the slide label to determine which section of tissue is the skeletal muscle. The three types of muscle should be mounted on the slide in the same order as they are listed on the slide label. After you have focused the skeletal muscle under low power, switch to high power for a detailed study of the tissue. Notice that the muscle appears to consist of many long, thin fibers packed tightly together. This arrangement produces the grain of the muscle. The dark spots are the nuclei of the cells. If you look carefully, you may see striations extending like fine, wavy lines across the -grain of the muscle. Study the drawings below in this lab and label the one that you think is skeletal muscle. Now observe the cardiac muscle. Use low power first and then high power. Cardiac muscle also consists of long fibers, but they appear to be somewhat thicker than the skeletal muscle fibers, and the nuclei are larger. Study the drawings below in this lab and label the one that appears to be cardiac muscle. Continue your study of muscle by examining the visceral (smooth) muscle under low power first and then under high power. Notice that the fibers are arranged in a somewhat more irregular pattern -than those of skeletal muscle and cardiac muscle. Label the drawing below and label the one that appears to be visceral muscle. Check your labels on all three drawings and observe the tissues again if necessary to make sure that you have correctly labeled each one. Part 1: Microscopic Structure of Muscle Diagrams Label the type of muscle (either skeletal, cardiac, or visceral) pictured. Also label nuclei and striations. 3 7 th Life Science Lab 11C Human Anatomy & Physiology: The Muscular System 3 Procedures Part 1 - Microscope 1. Observe and draw a preserved slide of a section of skeletal, visceral, and cardiac muscle. 2. Fill in the chart below, which deals with the three types of muscles. Drawings Part 1 (Slide # ) Human Skeletal Muscle Human Visceral Muscle Human Cardiac Muscle Three Types of Muscles Chart Voluntary or Involuntary? Skeletal Visceral Cardiac Striated or smooth? Where is it found? What does it control? Observations Part 1 1. Which of the three types of muscle appears to have the most parallel fibers? 2. Which of the three types of muscle has the most irregular fibers? 3. Which of the muscle types appears to have the largest nuclei? 4. Which of the types of muscle appears to consist of fibers that connect side to side like the off ramp of an interstate highways? 4 7 th Life Science Lab 11C Human Anatomy & Physiology: The Muscular System 4 Materials Part 2 Experiment: Control of Muscles clock with a second hand Procedures Part 2 Experiment: Control of Muscles Blink your eyes three times, then immediately begin holding your eyes open as long as you can. Do not roll your eyes around as you hold them open. Have a friend time you. How long were you able to keep your eyes open without blinking? minutes seconds Rest your eyes for at least five minutes with normal blinking and eye movement. Try the experiment again. How long were you able to keep your eyes open? minutes seconds Rest your eyes and try the experiment again. How long were you able to keep your eyes open? minutes seconds What is the average amount of time you can keep your eyes open? minutes seconds Compare your average to the average amount of time that other people in your class are able to keep their eyes open without blinking. Is there a significant difference? If there is a significant difference, what do you believe could account for it? Analysis and Conclusions for Part 2 Experiment: Control of Muscles 1. What is a voluntary action? 2. List several examples of muscle actions that are voluntary. 3. What is an involuntary action? 4. List several examples of muscle actions that are involuntary. 5. The reaction of blinking your eyes is stimulated when the surface of the eye begins to dry out. This action of blinking your eyes is controlled by muscles. Are the muscles that blink your eyes voluntary, involuntary, or both? Why did you choose the answer you gave? List several other actions that are controlled in the same way that eye blinking is. 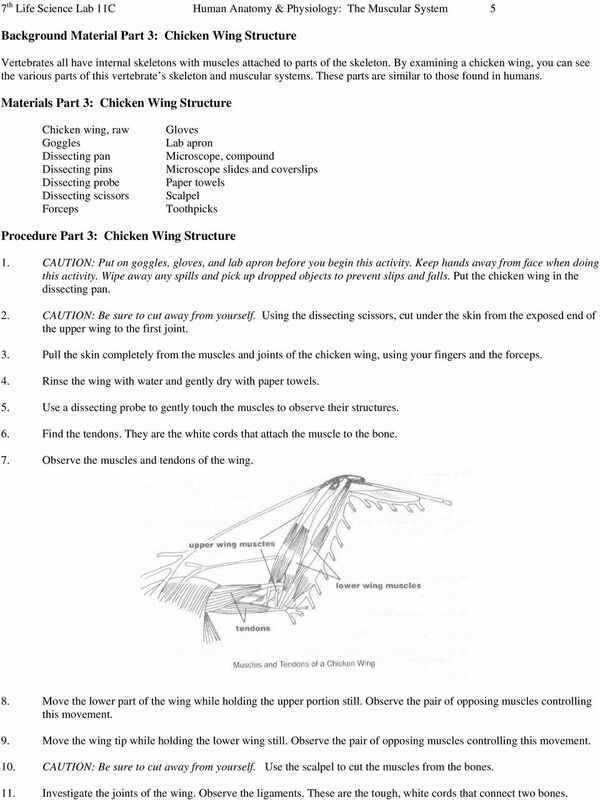 5 7 th Life Science Lab 11C Human Anatomy & Physiology: The Muscular System 5 Background Material Part 3: Chicken Wing Structure Vertebrates all have internal skeletons with muscles attached to parts of the skeleton. By examining a chicken wing, you can see the various parts of this vertebrate s skeleton and muscular systems. These parts are similar to those found in humans. Materials Part 3: Chicken Wing Structure Chicken wing, raw Goggles Dissecting pan Dissecting pins Dissecting probe Dissecting scissors Forceps Gloves Lab apron Microscope, compound Microscope slides and coverslips Paper towels Scalpel Toothpicks Procedure Part 3: Chicken Wing Structure 1. CAUTION: Put on goggles, gloves, and lab apron before you begin this activity. Keep hands away from face when doing this activity. Wipe away any spills and pick up dropped objects to prevent slips and falls. Put the chicken wing in the dissecting pan. 2. CAUTION: Be sure to cut away from yourself. Using the dissecting scissors, cut under the skin from the exposed end of the upper wing to the first joint. 3. Pull the skin completely from the muscles and joints of the chicken wing, using your fingers and the forceps. 4. Rinse the wing with water and gently dry with paper towels. 5. Use a dissecting probe to gently touch the muscles to observe their structures. 6. Find the tendons. They are the white cords that attach the muscle to the bone. 7. Observe the muscles and tendons of the wing. 8. Move the lower part of the wing while holding the upper portion still. Observe the pair of opposing muscles controlling this movement. 9. Move the wing tip while holding the lower wing still. Observe the pair of opposing muscles controlling this movement. 10. CAUTION: Be sure to cut away from yourself. Use the scalpel to cut the muscles from the bones. 11. Investigate the joints of the wing. Observe the ligaments. These are the tough, white cords that connect two bones. 7 7 th Life Science Lab 11C Human Anatomy & Physiology: The Muscular System 7 Analysis and Conclusions Part 4: Muscle Fatigue 1. Make a graph that shows the number of times you were able to open and close the clothespin in each trial. Number of Openings Test Number 2. What does your graph indicate about the onset of muscle fatigue with each succeeding trial? 3. 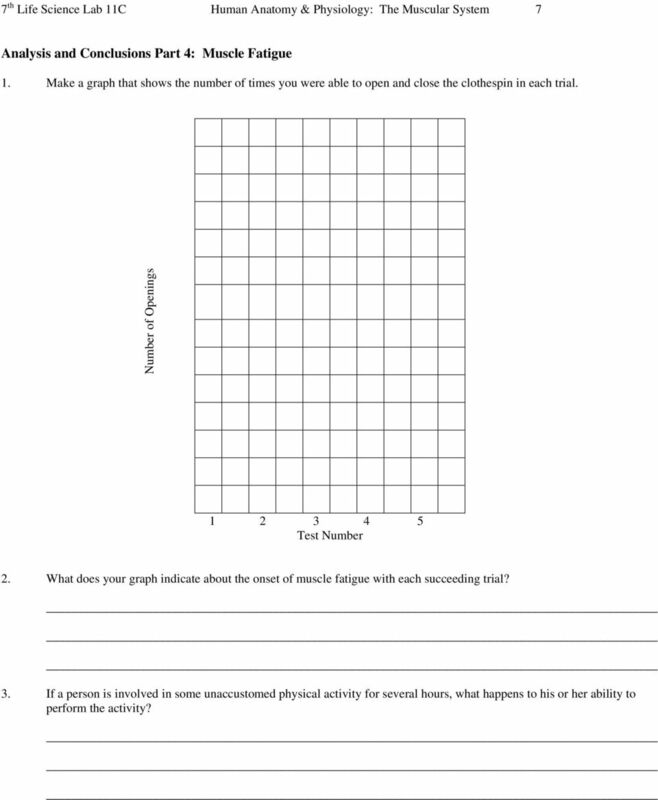 If a person is involved in some unaccustomed physical activity for several hours, what happens to his or her ability to perform the activity? 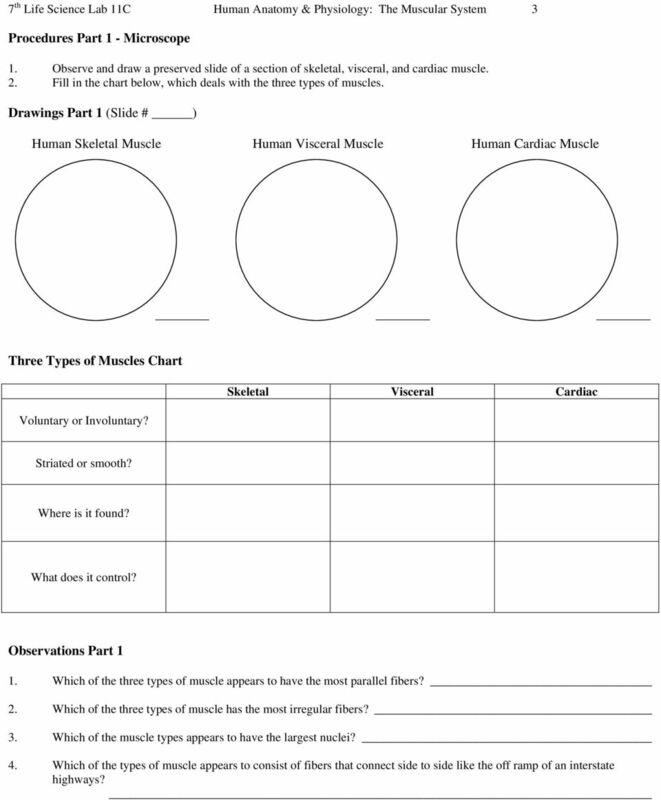 Lab #14H The Muscular System Pre- Lab Discussion Muscle tissue consists of groups of cells that are specialized for contraction. In the body, muscle tissue is usually organized into organs called muscles. SKELETAL AND MUSCULAR SYSTEMS WHAT MOVES YOU! SKELETAL AND MUSCULAR SYSTEMS WHAT MOVES YOU! FUNCTIONS OF THE MUSCULAR SYSTEM 1. Muscles are the motors that move body parts a) Muscles always pull, they never push FUNCTIONS OF THE MUSCULAR SYSTEM 1. MUSCLES G.C.S.E. PHYSICAL EDUCATION. Unit 1. Factors Affecting Participation and Performance. G.C.S.E. P.E. Teacher:. GIRLFIT STRETCH ZONE GET LONG AND LEAN! Deltoid Trapezius. Identify the muscle pair(s) that work together to produce the movements listed above. 1. On your student answer sheet, find the human forms numbered 1, 2, and 3. Color the heart on these forms RED. Match the following vocabulary words to their definition. Please write a capital letter in the blank. Practice Chapter 6. Figure 6.3. Multiple Choice Identify the choice that best completes the statement or answers the question. Practice Chapter 6 Multiple Choice Identify the choice that best completes the statement or answers the question. 1. Voluntary muscle tissue is; a. smooth muscle b. skeletal muscle c. dense regular d.
Name Class Date Laboratory Investigation 4B Chapter 4: Cell Structure The Microscope: A Tool of the Scientist You may refer to pages 66-67, 72-73 in your textbook for a general discussion of microscopes. The Muscular System. Muscle Tissue. ThiNK AbouT it How much of your body do you think is muscle? Key Questions. Vocabulary. 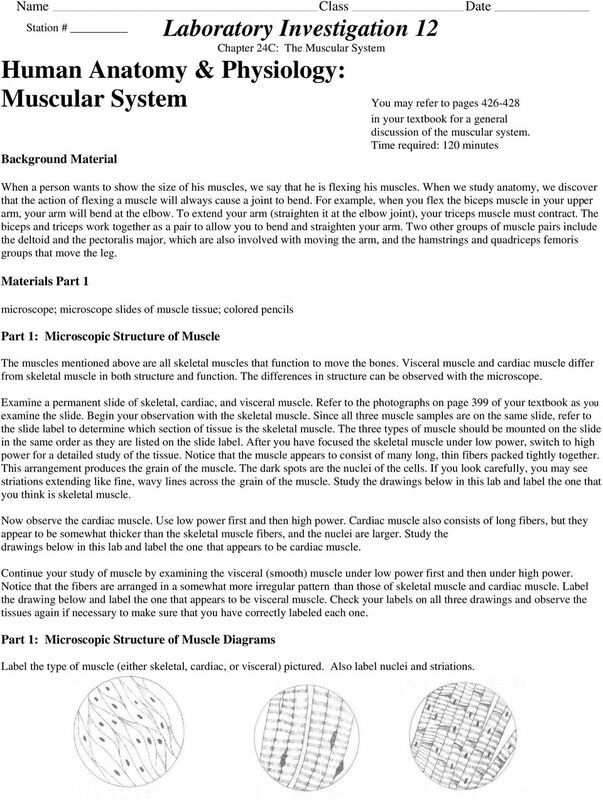 Muscular System Unit 6.5 (6 th Edition) Chapter 7.5 (7 th Edition) 1 Learning Objectives Identify the main characteristics of muscles. Compare the 3 main kinds of muscle. Describe the anatomy of muscle. 19 LESSON Joints and Movement Gymnasts train for years to perform exercises on the beam. Walking on it is one thing, but a front walk-over? There s a real challenge. JERRY WACHTER/PHOTO RESEARCHERS, INC.
Name. 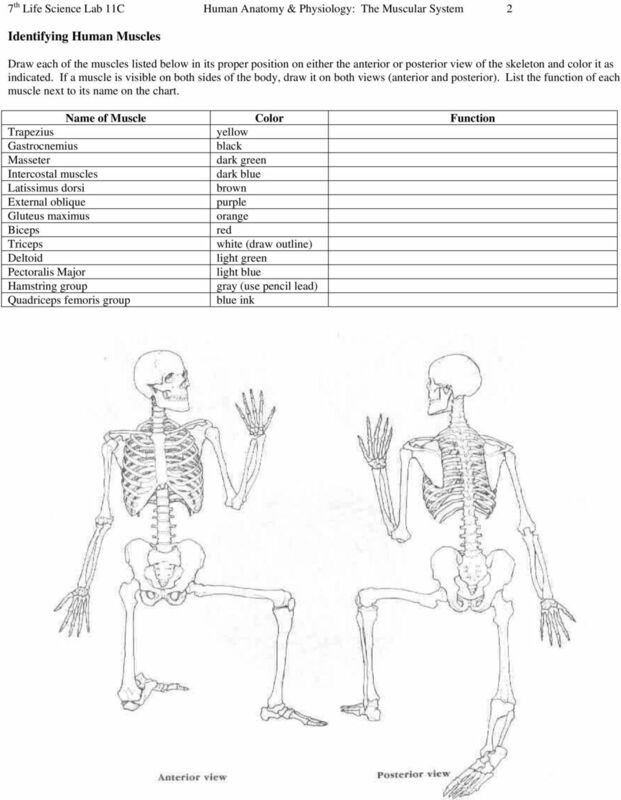 Most of the bones of the limbs (arms & legs) act as levers. These levers are powered by muscles. Bones as Levers 1 Name Bones as Levers You may not think of your limbs as being machines, but they are. The action of a muscle pulling on a bone often works like a type of simple machine called a lever. Questions on muscles. Q1: A muscles source of energy is: Q2: A muscle provides movement by: Q3: What holds a muscle to a bone? Goals. Language: Students will learn and utilize correct anatomical vocabulary to describe and label the different muscle types of the human body. THE BIOMECHANICS OF SKIING 4 This chapter provides background information on the biomechanics most relevant to skiing. It outlines how the muscles and skeleton function as a system to create balanced movement. ANATOMY & PHYSIOLOGY ONLINE COURSE - SESSION 6 THE MUSCULAR SYSTEM Introduction The muscular system is composed of specialized cells called muscle fibers. Their predominant function is contractibility. Muscle Contraction. 3. How many sarcomeres are shown in the above model? AP Biology Objectives Microscope Skills Review Name: After completing this worksheet, you will be able to determine the magnifying power of a microscope. determine the size of the field of view of a microscope. STRETCHING WITH ROB AND MARIAN HEFFERNAN. 213: HUMAN FUNCTIONAL ANATOMY: PRACTICAL CLASS 3: Arm and Thigh SUPERFICIAL FASCIA The superficial fascia is the fatty layer under the skin. It is separated from the muscles by the sheet-like deep fascia. Figure 11-1: The lever-fulcrum principle is illustrated by flexion of the forearm. Unit: Organization General Task. How Are Cells Differentiated?